US authorities on Tuesday charged eight people in a scheme to profit from stolen corporate information hacked from a government database, court papers showed. The scheme, which involved suspects in Ukraine, Russia and the United States, pulled in more than $4.1 million ill-gotten gains from trading on securities filings before they became public, according to the Securities and Exchange Commission. "Today's action shows the SEC's commitment and ability to unravel these schemes and identify the perpetrators even when they operate from outside our borders," Stephanie Avakian, co-director of SEC enforcement, said in a statement. The SEC's Electronic Data Gathering, Analysis, and Retrieval system, known as EDGAR, is a repository of corporate disclosures meant for distribution to investors simultaneously. In one instance, Ieremenko and Radchenko allegedly netted $270,000 by investing in a public company after stealing an annual report from EDGAR, which showed record annual earnings, in the hour before it was released to the public, according to federal prosecutors. 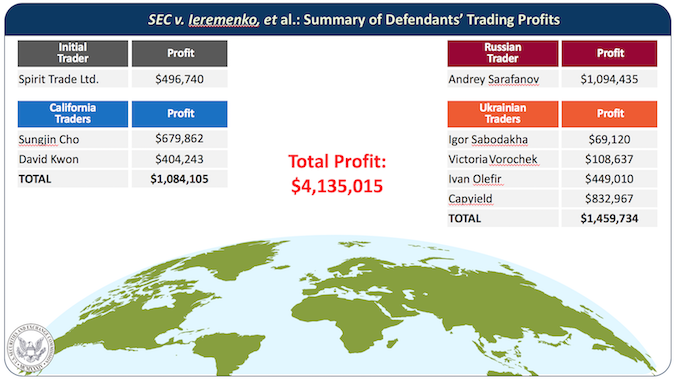 In its parallel legal action, the SEC named three Ukrainians, a Russian and two Los Angeles-based traders accused of trading on the stolen information. One, Andrey Sarafanov of Dedovsk, Russia outside Moscow, allegedly traded on behalf of three Moscow residents from whom the SEC is also seeking the return of ill-gotten gains.